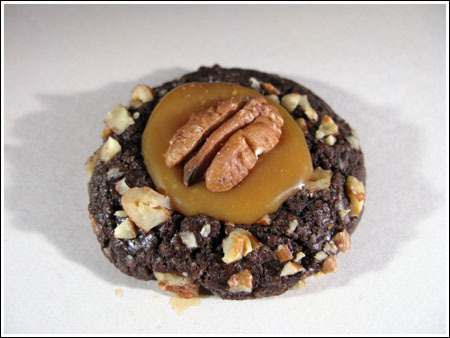 Today’s cookie is themed after one of my grandfather’s favorite candies, turtles – blobs of caramel topped with chocolate and studded with 4 whole pecans which jut out of the sides like turtle legs. Turtles are so popular they’ve become the namesake for many desserts with a combo of caramel, pecans and chocolate. This is one of them, and it’s from my contest buddy, Jannine. Jannine wins all kinds of contests, but where she really excels is state fairs. This recipe won a blue ribbon. To win a state fair, you have to really stand out Jannine did that by using dulce de leche instead of plain caramel and piping it out through a star tip. But that’s not all. She topped the cookie with a pecan then drizzled the whole thing milk chocolate. The end result looked something like this, though Jannine’s are prettier. If you like Jannine’s but don’t have a star tip and/or dulce de leche, you can also make your cookies like this. I’ve written how in the notes below. Separate egg. Reserve the white, then add yolk, milk and vanilla to the butter and sugar mixture. Beat well. Combine the flour, cocoa and salt. Add to the wet mixture and mix until combined. Cover and refrigerate dough for 1 hour. Preheat oven to 350 degrees F. Remove dough from refrigerator and shape into 1 – inch balls. Dip each ball in the reserved egg white, then roll in the finely chopped pecans. Place on greased baking sheets. Using your thumb, make a deep indentation in the center of each ball. Bake for 10 – 12 minutes or until set. Place the Dulce de leche milk caramel in a pastry bag with a star tip and fill the center of each cookie. 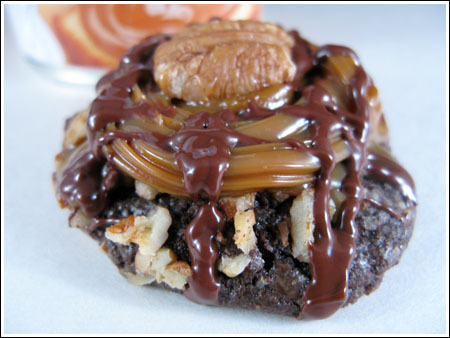 Place a toasted pecan half on top of each cookie and move to a wire rack to cool. In a small microwave safe bowl, microwave the milk chocolate and light cream on high for 30 – 60 seconds or until melted. Drizzle over the top of each cookie and let rest until chocolate is set. Anna’s Notes: My cookies spread a little and the indentations all but disappeared. To fix this, as soon as the cookies came out of the oven, I stuck the handle of a wooden spoon in the center of each cookie and gently molded a hole in the hot baked cookie. Because the first store I went to was out of dulce de leche, I decided to see how caramels would work. I melted a few at time to experiment and had success with the ratio of 1/2 tablespoon of half & half to 6 caramels. To melt the caramels, put 6 caramels in a large (2 cup) glass measure or microwave safe bowl. Add 1/2 tablespoons half & half. Microwave on high for about 1 minute, stopping every 30 seconds to stir. You’ll probably want to use 18 caramels plus 1 1/2 tablespoon of half & half. Also, you may melt in a small saucepan instead of the microwave. Instead of using milk chocolate, I used dark chocolate and omitted the cream. To drizzle, I put the melted dark chocolate in a heavy duty zipper bag (freezer bag), snipped a very tiny hole off the corner and drizzled. UPDATE: It appears that the recipe was adapted from Gourmet Magazine where it was submitted by Sue Morris. The recipe is not on Epicurious, but can be found here. Thanks Louise! That link is perfect. No need to fax. I’ll go ahead and reference that above. Gourmet and Epicurious don’t seem to have it on their websites, but I still have the original copy of the magazine. Gourmet had an article “We Asked For It Holiday Cookies”. The recipe was submitted by Sue Morris of Oshawa, Ontario. If you look at the bottom of this recipe, you’ll see it referenced. http://www.wchstv.com/gmarecipes/chocolatecarmeltreasures.shtml I can’t do it right now, but I’d be happy to fax you a copy from the article. Do you happen to have a link to the original? If it’s the same recipe, then Gourmet should get credit too. This is the Chocolate Caramel Treasure recipe from the December 1999 Gourmet magazine with pecans instead of hazelnuts. Saw the picture, now must have the cookie!!! Looks AMAZING! Yum-a-luma-ding-dong. These look sooooo good. I will have to add that canned dulce de leche to my Christmas Scavanger List. Thanks for another great recipe fer sure..fer sure! Those look so decadent! YUMMY! Anna, your cookies are beautiful and no doubt delicious. Chocolate, caramel, and nuts. What could be better!? For those of you looking for dulce de leche. Canned dulce de leche can sometimes be found in the hispanic section of the grocery store. Oddly enough we can even get it up here in most of the stores. Remove label from can. DO NOT OPEN CAN! Poke a few holes in the top with a clean nail or bottle opener. Place in saucepan with enough water so that 2/3 of the can is covered by the water. Boil for 3-4 hrs. Watch the water so it maintains that level. Remove from water & carefully remove lid. Stir until smooth. 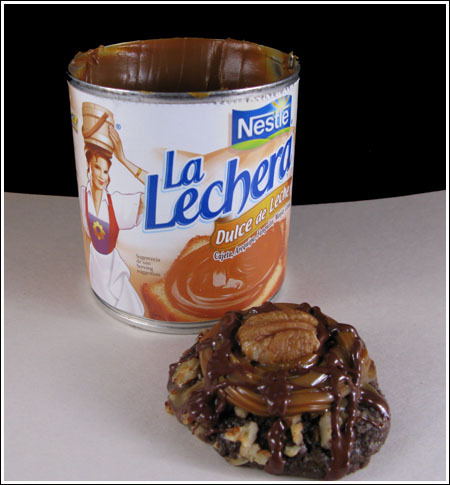 Anna, Thanks for a great way to use Nestle’s LaLechera. The cookies look delicious! Anna, I am definately going to try that recipe you emailed me after the holidays. I am thinking of trying to convert it into some sort of shrimp appetizer of sorts. I’ll let you know how that goes. Here is the easiest recipe ever to make your own dulce de leche: Take the label off of a can of sweetened condensed milk. Put in in your empty slow cooker. Fill the slow cooker with water making sure to completely cover the pan. Put the lid on the slow cooker. Turn it on low. Walk away for 10 hours. I do it overnight. Turn off the slow cooker. Let the water and can cool. Gorge yourself on amazing, sweet, caramely dulce de leche. You can also easily do two cans. I don’t do a lot of cookie baking, but I may just have to give these a shot. My most glorious spousal unit is a caramel junkie (she is chewing one right now — I’m not making this up). wooww looks so rich but so gooodd! Anna, those look incredibly great! I just read about your pecan pie being in the freezer, so I’m going to make your recipe tomorrow and freeze it. I hate leaving everything to Wednesday or Thanksgiving day to cook. Joanna, the pecan pie is done. It’s in the freezer. Fuzz is going to make the pumpkin pie and I have a feeling I’ll make a last minute chocolate cake. wow these sound soo delectable! i think both versions look equally delicious and sinful. do you know what treats you’re making for thanksgiving yet? Goodness! Those look really yummy! I don’t know why, but I keep finding things at Target (super center) that I keep hearing everyone talk about not being able to find–such as the pumpkin spice Kisses (gone now), cinnamon chips, and dulce de leche. If you can’t find something, just a suggestion to try Target if you have one nearby and haven’t looked there for obscure items! These look so great, the perfect addition to a holiday cookie tray! MMmm…amazing looking cookie! Caramel…perfect for the holidays! Thanks for the extra tips for success. I am drooling right now. I have not found the dulce de leche so thanks for the alternate way.